Elaborating on this, the Promised Messiah (as) states, ‘Purify your heart so that your Benevolent Master becomes pleased with you (he is advising us) so that you become pleased with Him.’ Then, on one occasion the Holy Prophet (sa) says ‘do not reproach my companions.’ There are various Muslim sects and when they raise allegations against one another, Shi’as in particular, they say many things about the companions. The Holy Prophet (sa) said ‘do not reproach them and do not criticise any of their actions. By God, in Whose hand is my life, even if you give charity of gold equivalent to the mountain of Uhud, you will not receive the same reward as them, which they received as a result of spending merely one or two portions or even half thereof.” Thus, these are people, whose status and rank is very high and who are an example for us. We must follow them if we wish to acquire the pleasure of Allah the Exalted. We should never speak against any of them, nor should we think ill of them. Further enlightening us about the status and rank of the companions, the Promised Messiah (as) states, ‘If one observes with an eye of justice the sacrifices the companions of our perfect Guide (sa) made in the cause of God and His Prophet (sa); they were exiled, endured persecution, bore various forms of hardships and sacrificed their lives, however, they marched forward with truthfulness and devotion. Thus, what caused them to be so devoted? It was the passion for the true God, the rays of which had penetrated their hearts. The companions were those, who sacrificed their wealth and their homeland in cause of the truth and left everything behind. Perhaps you have heard the incident regarding the Siddiq-e-Akbar [Hazrat Abu Bakr], may Allah be pleased with him, on numerous occasions. Once, when people were asked to spend their wealth in the cause of God, he presented all of his possessions. When the Holy Prophet (sa) inquired what he had left behind, he replied that I have left God and His Prophet (sa) in my home.’ The status of Hazrat Abu Bakr was as the chief of Mecca. However, when he became a Muslim, he started to wear only a blanket. Furthermore the following verses of the Holy Qur’an have entirely depicted their way of living by stating that [Arabic] (Al-Anfal: 61) and (Aal-e-‘Imran: 201).’ That is, tie your horses at the frontier, whereby you may frighten the enemy of Allah and your enemy. O ye who believe! Be steadfast and strive to excel in steadfastness and be on your guard. Continue to be patient and demonstrate patience. The Promised Messiah (as) states, ‘What is the meaning of Ribaat? The horses which are tied at the frontier of the enemy are called Ribaat. Allah the Exalted commands the companions to be prepared to confront the enemies. Through this word of Ribaat, He turns their attention towards truly being prepared. They were entrusted with two tasks. Firstly, to physically confront the enemy and the second was to confront them spiritually. For spiritual confrontation there is also a command for Ribaat and that one must be prepared at all times. He states that in the dictionary Ribaatalso means the soul and the human heart and remarkably it is only those horses that are tamed and well-trained which can do this. Nowadays the teaching and training of horses are carried out in this manner and they are tamed and taught just as children are taught with special care and attention. If they are not taught, then they cannot be tamed and will be completely useless. Instead of being of use they will end up feared and harmful. Hence, the soul must also be trained in this way and be kept under control and the need to teach it is also there. Thus, Ribaat will only happen when a believer endeavours to make progress in knowledge and in actions and by controlling his desires. How excellent was the example of the companions who were born as a result of the spiritual power of the Holy Prophet (sa). I shall present some of these examples. We find the example of Hadrat Abu Bakr (ra) in the writings of the Promised Messiah (as) that at the time of need he brought all the goods in his house to present it. Listen now to an incident highlighting his humility and fear of God. Once Hadrat Abu Bakr (ra) had a disagreement with Hadrat Umar (ra). They argued for a long time to the point where their voices were raised out of anger. Afterwards when it had ended, Hadrat Abu Bakr (ra) went to Hadrat Umar (ra) and apologised for raising his voice during the altercation and for using strong words. However, Hadrat Umar (ra) refused to forgive him. Thereupon Hadrat Abu Bakr (ra) went to the Holy Prophet (sa) and related the whole incident. 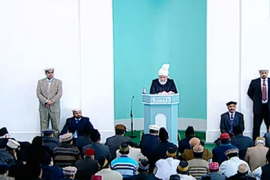 He said that I have come to you to apologise for this, upon which the Holy Prophet (sa) replied may Allah forgive you. A short while later Hadrat Umar (ra) began feeling remorseful and embarrassed and realised his fault. He too went to the house of Hadrat Abu Bakr (ra) and asked to be pardoned. When he arrived, he did not find him in the house. He then went to the Holy Prophet (sa). When the Holy Prophet (sa) saw him, his face became red out of his displeasure. Seeing the Holy Prophet (sa) displeased with Hadrat Umar (ra), Hadrat Abu Bakr (ra) fell to his knees and said the fault was his so forgive Hadrat Umar (ra). This was his humility and fear of God. This was that pure society which the Holy Prophet (sa) established and those who lived in it became the recipients of God Almighty’s pleasure. There is an incident regarding the humility of Hadrat Umar (ra) when a man said to him that you are better than Hadrat Abu Bakr (ra). Hadrat Umar (ra) replied in a passionate manner that by God just one night and day of Hadrat Abu Bakr (ra) is better than the whole lives of Umar (ra) and his progeny. He said “his night was that when the Holy Prophet (sa) had to migrate in the night and Hadrat Abu Bakr (ra) accompanied him. His day was that when the Holy Prophet (sa) passed away and the Arabs denied praying and giving the Zakat. At that time, against my advice, he resolved to do Jihad and God Almighty made him successful in this and proved him to be right. Then there is another great companion of the Holy Prophet (sa), Hazrat Usman (ra), who was also the third Caliph. Hazrat Ayesha (ra) relates that Hazrat Usman (ra) was the most kind and compassionate than anyone else and also feared God Almighty the most. When the Masjid Nabvi [the Holy Prophet’s mosque] was being extended, the Holy Prophet (sa) said that the all of the neighbouring houses should be included for the expansion of the mosque. At this point, it was Hazrat Usman (ra) who stepped forward immediately offered to buy those houses and gave 15,000 Dirhams and purchased the area. The Muslims once faced great shortage of water supply. There was a well which belonged to Jew and it was difficult to access water from there. Hazrat Usman (ra) purchased the well at whatever the price the Jew set and arranged the water supply for the Muslims. This was his great compassion for his fellow people. Then there is Hadrat Ali (ra). Ameer Muawiyah once told someone to describe the attributes of Hadrat Ali (ra). He said will you listen to what I have to say about him? He replied yes, speak. If you must listen then hear that he possessed great courage and was very strong. He spoke decisively and decided matters with justice. A fountain of knowledge and wisdom flowed from him. He dreaded the splendour of the world and loved seclusion at night i.e. his favourite act at night was worship rather than being indulged in worldliness. He would weep often and ponder over things for a long time. He would live a very simple life like us. By God, despite our love and affection for him we would refrain from saying anything to him or say anything openly due to his awe. He respected religious people and would give shelter to the poor. Abdur Rahman Bin Auf (ra) was a companion of the Holy Prophet (sa). He held a high status in terms of his financial sacrifices. He was a very wealthy trader and had riches in abundance. Once, he was heard praying while circling the Kaaba ‘O Allah! Save me from the covetousness of my soul.’ On one occasion his [commercial] caravan arrived at Medina which had 700 camels loaded with wheat, flour and other products. When Hadrat Abdur Rahman (ra) came to know of this he came to Hadrat Ayesha (ra) saying that I call you to witness that I dedicate this whole caravan of 700 camels fully loaded with goods, including the camels, in the way of Allah. One can appreciate the high status of Hadrat Abdur Rahman (ra) from the incident when once he had an altercation with Hadrat Khalid (ra). The Holy Prophet (sa) said O Khalid! Do not say anything to my companion. Even if one of you gave a mountain-full of gold the size of Uhud you would still not reach the morning and evening of Abdur Rahman Bin Auf (ra) which he has spent doing Jihad in the way of Allah. Another companion was Saad Bin Waqas (ra). The incident of declaring his faith after accepting Islam is so, he himself states that when I accepted Islam my mother asked me what religion have you now adopted? You must forsake this religion in any case otherwise I will not eat or drink anything and will go on a hunger strike until I die. He says I told her not to do this because I can never leave my religion, but she did not listen and for three days and nights she did not eat or drink anything. She became weak from starvation. I then went to her and told her ‘by God, even if you had 1000 lives and one by one they all left you I would still not forsake my religion. When she saw this resolve of her son she started once again to eat and drink. God Almighty states that we should obey our parents and serve them, but when it comes to matters of faith and of God then one must first listen to the word of God. Zubair bin Al ‘Awaam, who was one of the Companions (ra) of the Holy Prophet (sa), was absorbed in the fear of Allah. He was always fearful to do something that Allah Almighty would hold him accountable for later on. He was also very courageous and brave. When the siege of Alexandria was prolonged, he tried to climb the wall of this fortress using a ladder. His companions warned him about the severe spread the plague inside the fort. He responded: “It does not matter. We are here to combat the spear as well as the plague”. He was very wealthy and would give away a majority of his earnings in charity for the sake of Allah Almighty. Then there is an account of a companion named Talha bin ‘Ubaidullah (ra) who was also very rich and would spend in the way of Allah Almighty. One of his attributes that relates to marital relations was shared by one of his wives: “Hazrat Talha (ra) would return home joyously with a smile on his face. He was a very busy person, but he would not return home with such expressions on his face that would scare away his family members. He would return home in a pleasant and delightful mood and would go out in the same manner. He would always treat his family members in a polite manner and was always happy. It never occurred that his mood would change when he was at home or when he went outside. She states: “When I asked for anything, he never showed miserliness and would always give [readily]. He would also give when I did not ask for anything and would not wait for me to make a demand for something.” Thus, these are the principals that lead to matrimonial harmony and strengthen the marital relations. Hence, this is a model for us to follow. An incident regarding the obedience to Khilafat of a companion, Abdullah bin Masood, has been narrated as follows: Hazrat Umar (ra) appointed him to the people of Kufa in order to teach and morally train them. Since the people of Kufa would create mischief and this subsequently led to many issues, Hazrat Usman (ra) relieved him from his duty as the Amir and called him back to Medina. However, the people of Kufa pleaded with him that he should not go back and stay with them. Hazrat Abdullah bin Masood (ra) replied that obedience to the Khalifa of the time was obligatory upon him and that he could never allow himself to disobey him and returned to Medina. In regard to Hazrat Abdullah bin Masood (ra), one of the narrators stated that he had sat in many gatherings of the companions but Hazrat Abdullah bin Masood (ra) was unrivalled in respect to his detachment from the world and deep attachment with the hereafter. Thus, he made use of worldly objects, but at the same time he was not deeply attached to it either. Then, there is Hazrat Bilal (ra), who endured every kind of difficulty, but he always proclaimed the oneness of God. He would be dragged across hard stones and hot sand but despite this he remained firm on his faith and would always repeat the words, ‘Ahad, Ahad’ [one God] and that there is none worthy of worship expect Allah and Muhammad (sa) is His messenger. Thus, we should endeavour to reform ourselves and keep our [spiritual] vessels clean. Since we have accepted the Promised Messiah (as), the Imam of the age and ardent devotee of the Holy Prophet (sa), then we must strive to act on all the teachings mentioned by the Promised Messiah (as). The first example was set for us by the Holy Prophet (as) and after that by his companions. Only by following these examples can we become true Muslims. May Allah the Almighty enable us to do so.